When BBOWT get in the first thing they will do is apply for HLS and we will start all over again. I was of the view that we were winning slowly. The half halt on the fencing at Padworth and Chorleywood, and what appeared to be a slowdown in applications was hiding the new reality. VIRTUAL FENCING!! I am cross with myself for taking my eye off this particular ball. Google Burnham Beeches Cattle, and you will see its here and working. I have spoken to the head Ranger, and found that the cattle used have adapted to it with ease. I am sure many of you would have heard me saying that the opposition has to be won on the Conservation issues, and as Mark Fisher has been stating. The next episode starts here! Well done for bringing this up. Virtual fencing will be trialled at Epping Forest, in conjunction with cattle grids, under a commercial contract for conservation grazing that has no involvemnt of any commoners. The City of London, as owners of Epping Forest, are the recipient of a massive HLS for grazing. They have already put up miles of linear fencing, without seeking any permission. "The „Bovigard‟® system transmits a localised radio signal from a continuous buried wire marking the boundary of a specified grazing area. Collars worn by cattle are activated by proximity to the boundary signal and administer audible stimuli and warning shocks to electronically "heft‟ the animals within the area specified by the wire." 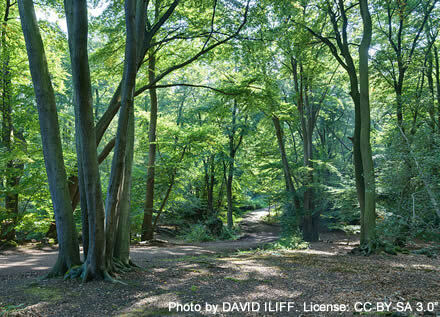 The Friends of Epping Forest have challenged all the proposals for re-instatement of grazing for 10 years or so, objecting to what they think is the ecological fallacy behind them, particularly the nonsense of open woodpasture (a savanah landscape - pace Frans Vera) being the natural state of the forest. They made a statement of case at the PI on the cattle grids. Of course the Inspector did not want to get involved in a debate about the grazing, as he just accepted what the Conservators and Natural England said about it, even though other evidence was put in front of him! Sound familiar?